Follow our advice to make naps a snap. Wondering how much a newborn should sleep? At first, your newborn will probably sleep far more hours than he's awake—sneaking in a catnap whenever and wherever he wants. "His governing factors are sleep and hunger, and they override everything else," says Jodi Mindell, Ph.D., author of Sleeping Through the Night. It's too early for your little one to begin sleep training, but make sure he wakes for feedings every few hours during the day. 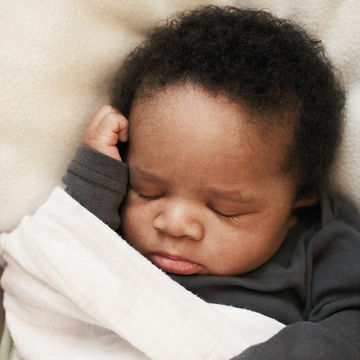 Once he's 3 months old, you can start to get serious about his Z-schedule, since regular sleep makes for a happier baby—and mom, Mindell says. Wake your baby around the same time every morning. Put him down for a nap about the same time each day: 9:30 a.m., 2:30 p.m. and possibly 5:30 p.m. if he seems drowsy. Too rigid for you? Just put your little one to bed two hours after he wakes up, whenever that is, throughout the day. Signal it's nap time with a shortened version of your nighttime routine. "If you typically sing lullabies to your baby at night, sing a few before his nap as well," says Mindell. Then put him down while he's drowsy but still awake. Drop a nap by about 9 to 10 months. Most babies should rest twice a day—at around 9 a.m. and 2 p.m. Aim to have him nap in the same spot where he sleeps at night. If you get in the habit of nursing him to sleep in the glider or putting him in a stroller or swing, be warned: Eventually he won't be able to fall asleep any other way. To the crib with him! Follow @FitPregnancy on Twitter for more of the latest pregnancy and parenting tips!